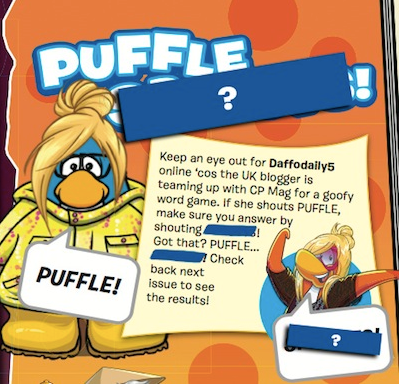 Club Penguin Cheats by Mimo777 Club Penguin Cheats by Mimo777: UK Magazine: Daffo's "PUFFLE!" Game! The new issue of the Club Penguin Mag came out today! Check out this new game Daffo came up with! So I wanted to tell you about this new game I've created with the magazine team. It works like this; if you meet me online I'll shout "PUFFLE!" and then you guys have to reply with a specific word... which you can find in the new issue of the mag! If you shout the correct word back at her, you might be featured in the magazine and on the blog! Cool cool!